Apitherapy or Bee venom therapy (derived from the Latin word apis, meaning bee) is the medicinal use of products made by honeybees. Bee Venom Therapy has magnificent healing properties and is effective for the treatment of multiple chronic and autoimmune conditions. Homeopathic honeybee venom therapy is a natural anti-inflammatory and pain reducing agent. Therapies using the honeybee have existed for thousands of years. The ancient rock art of early hunter-gatherers portrays the honeybee as a common source of natural medicine. Bee Venom Therapy was practiced in ancient Egypt, Greece, and China, three Great Civilizations known for their well advanced medical systems. Hippocrates, the ancient Greek physician known as the “Father of Medicine”, identified the healing properties of bee venom for treating arthritis and other joint problems. Today, there is scientific evidence developing that suggests that various bee products promote healing by improving circulation, decreasing inflammation, and stimulating a healthy immune response, according to the American Apitherapy Society. As stated by Holistic MD, it is particularly helpful for patients with arthritis, fibromyalgia, neuralgias, lyme disease, Bell’s palsy, carpal tunnel syndrome, herpes zoster, osteoarthritis, multiple sclerosis and many other conditions. You can go to a practitioner and have them inject bee venom stings using a siring.I recommend starting of this way. 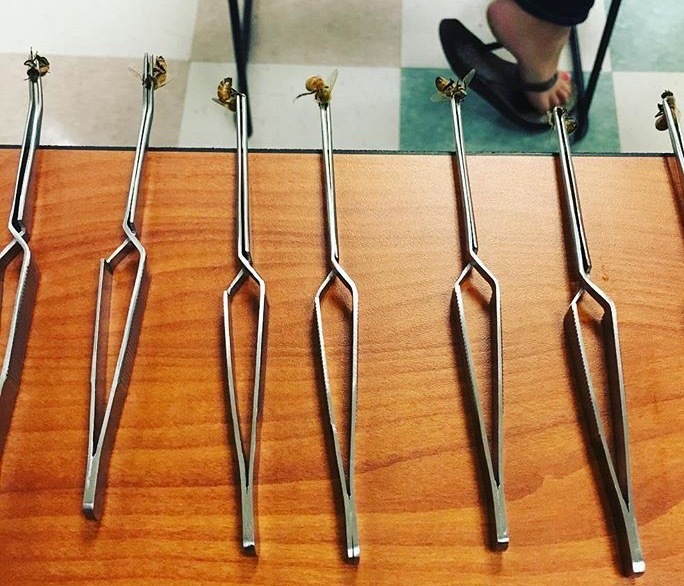 This way, the practitioner who is injecting you, for example, can inject an equivalent to one honey bee venom sting into 10 different shots on your body. That way, if you are very sensitive to the sting, you will not blow up a grand amount in one spot on your body. The practitioner can also test before doing thing with a small amount how reactive you are to the honey bee venom. As you continue to get treatments, your tolerance to the bee venom stings will get better, allowing your body to receive more venom. You can also get live honey bee venom stings from a practitioner. This way supposedly has more benefits coming from a live bee. After building up a tolerance, you can start getting live honey bee venom stings. The last way to do this, is ordering bees and stinging yourself. There is a community of people on facebook, most who are chronically ill who use this method. The group is called Pioneers: Healing Lyme with Bee Venom Therapy. Here, they have a specific Bee Venom Therapy Protocol to follow. Most reactions are mild. Most people experience redness, mild swelling, heat and itching in the area of the injections, which is a conventional part of the treatment process. This can last from a few minutes to 2-5 days and go away by themselves. More serious reactions include flu-like symptoms lasting up to several days. This herx reaction is also routine as your body is going through a fighting/healing response. It is best to do nothing, to recognize the reaction and allow the body go through the healing process. Melitin: Powerful Anti-Viral , Anti-bacterial & Anti-inflammatory , Stimulates ACTH secretion in the Pituitary Gland , Destabilizes all the membrane structures at the level of the phospholipids – which produces Strong anti-inflammatory effects. Long-lasting, short-acting histaminic effects: Increased capillary permeability, edema (swelling), temperature elevation, itching, pain; increased vitality and sense of well being; forces bee venom to attach to negatively charged cell wall; anti-oxidant action. Apamin: Stimulates central and peripheral nervous system. Stimulates secretion of serotonin and dopamine; anti-arrhythmic. So it Increases central and peripheral pain threshold, decreases pain, increases sense of well-being. Adolapin: Inhibits enzymes in metabolic cascades of arachidonic acid and cyclo-oxygenase. so it has an anti-inflammatory and analgesic / pain releife action. Mast Cell Degranulating Peptide (MCDP or peptide 401): Has Anti-inflammatory actions (approximately 100 times stronger than hydrocortisone) So it Reduces inflammation and pain through local action on tissue inflammation. Activates adrenal and sympathetic system. Hyluronidase, Secapin, Tertiapin, Procamine: Anti-inflammatory , Pain relief by inhibition of “substance P” ( It function as a neurotransmittor and neuro-modulator , Substance P is released from the terminals of specific sensory nerves, it is found in the brain and spinal cord, and is associated with inflammatory processes and pain). Compound X , Phospholipase A2 , Histamine: Involved in the inflammatory response of Venom, with the softening of tissue and the Facilitation of flow of the other substances deeper into the tissues. Measurable amounts of the neurotransmittors: Dopamine , Norepinephrine and Seratonine. “ABOUT APITHERAPY :American Apitherapy Society.” ABOUT APITHERAPY :American Apitherapy Society. N.p., n.d. Web. 09 Feb. 2017. “Apitherapy: Homeopathic Bee Venom Therapy.” Holistic MD. N.p., n.d. Web. 09 Feb. 2017. “Bee Venom Therapy Clinic (Bee Sting Therapy) at Queens , New York. USA.” Bee Venom Therapy Clinic (Bee Sting Therapy) at Queens , New York. USA. N.p., n.d. Web. 09 Feb. 2017. My niece had me do this for her in the early 90s. She has MS. She swore it helped but I could never get used to it. I’m terrified of insects. Wow thanks for sharing! I saw how it helped people with MS. Thanks for sharing from first hand experience!! That’s great you did it for her regardless of your insect phobia!